Me eyeing a bottle of Aquadeco while wearing my Flower#19 Pendant inspired by the Art Deco building at 19 East 88th Street. The photo is backwards because I took it on my webcam/Apple Photobooth. Apparently, this is not new to the world but I just discovered it this evening at the Duane Reade on 89th Street and Madison Avenue. 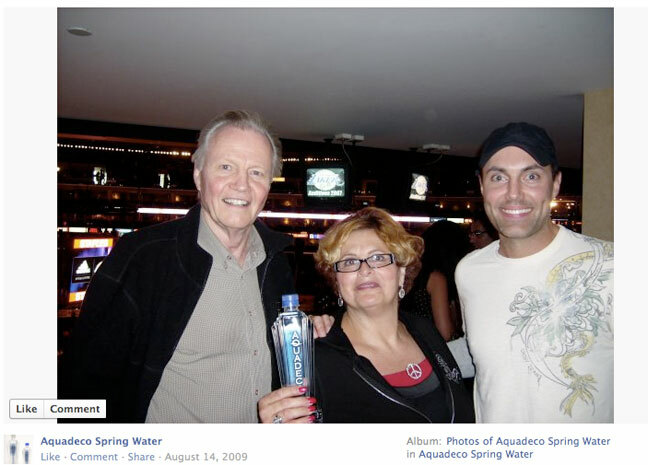 Aquadeco – a bottled spring water company that first designed a bottle and then set about finding a water source, according to their website. I do not disagree with the “novelty perfume” aspect of the Aquadeco bottle and the Chanel/Woolworths comment is super on point. It is a cliched representation of Art Deco but… I like it! There were many comments below Steven Heller’s blog post arguing against the pointless waste of this fetishistic design and that new designs should be sustainable. Ok, I know they’re right! But, having been an eager scholar of the subject of Decadence in both high school and college, I can’t help but find this kind of vanity project endearing. 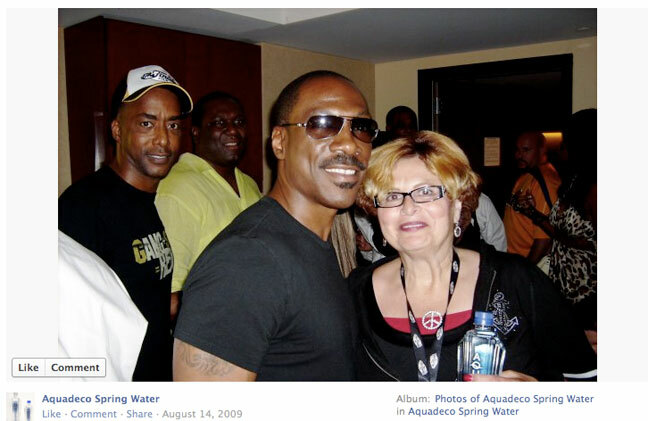 The founder of Aquadeco, Arnold Gumowitz is a real estate developer and art collector and Aquadeco seems to be a platform for sponsoring or being involved with celebrity events and Art Deco related events. 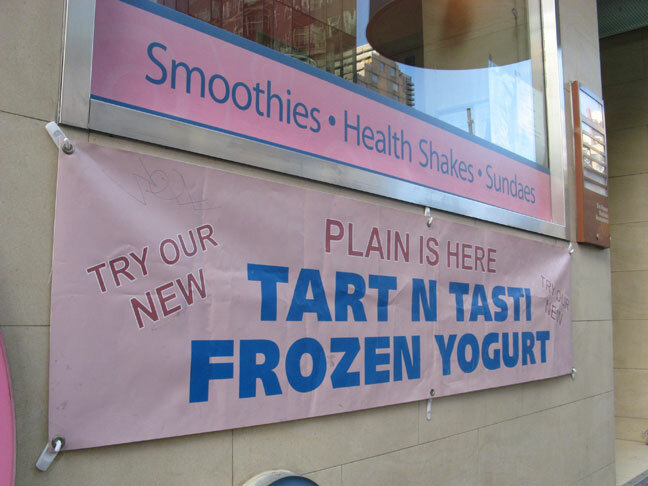 It does taste good, too (I just tried it). This plastic bottle was $1.99 tonight and no more expensive than similarly sized bottles. 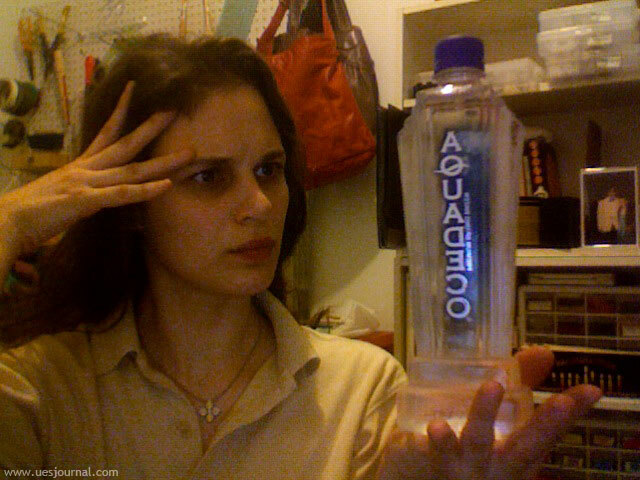 I read that Aquadeco also make a $12 glass bottle with an optional light to place beneath. Not on my shopping list this week but maybe someday. I suppose if you could remove the logo and keep the glass bottle as a vase it would be a little more environmentally friendly. Also, here are three pics from the Aquadeco facebook page. Now, C Here, Jamba Juice! U have 2 wear ur Orange Letter! The last time I vomited was also the last time I ate at Jamba Juice on Lexington Ave and 87th Street, two years ago. It was the oatmeal with some sort of “berry” topping. Granted, I was hungover, but I have never on any other occasion in my life vomited in association with alcohol consumption. 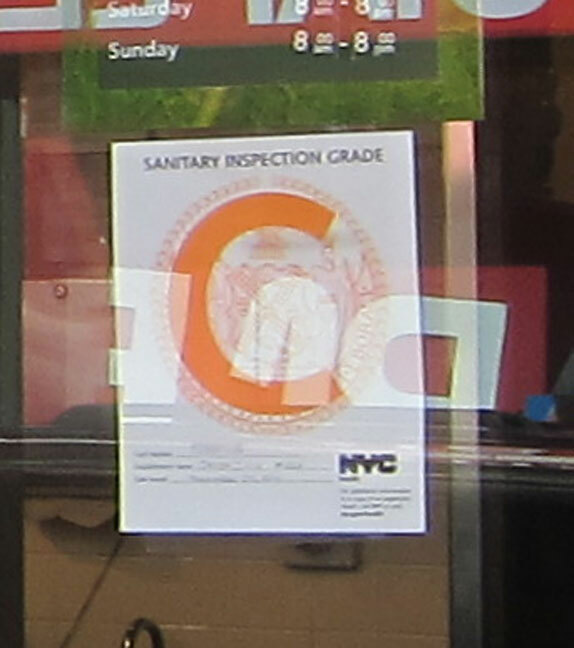 Anyhoo, I felt vindicated when I saw this Jamba Juice had received a “C” on their restaurant report card from the city health inspector. I took this picture on March 8, 2011. BUT! Only a few days later the orange “C” was gone and nothing has replaced it still, as of April 2. WTF? I had to add my own C.
More information on food safety inspection here. 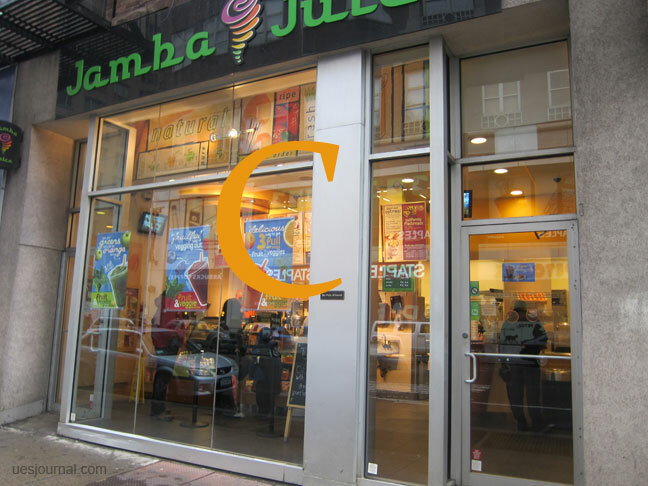 Author rebsPosted on April 2, 2011 February 25, 2014 Categories Food, Rebs' JournalTags C, grade, inspection, Jamba Juice, letter, new york, report card, sanitation, vomitLeave a comment on Now, C Here, Jamba Juice! U have 2 wear ur Orange Letter! 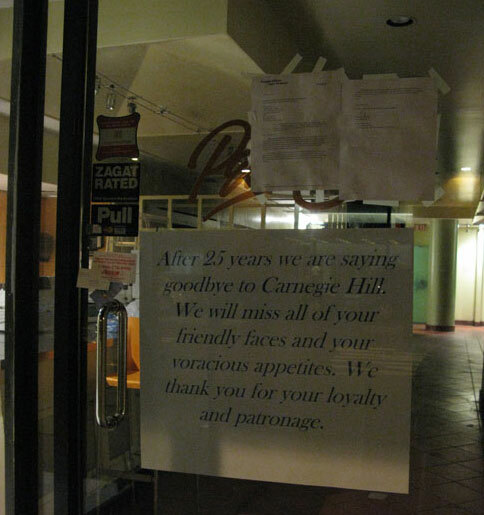 Carnegie Hill is changing fast.Â I go to the West Coast for one week and Petak’s closes! Katie texted me while I was in Las Vegas and I was shocked.Â I walked by the empty store the other night and passed a man carrying a Petak’s bag- I looked at the sign on the store window, then at him and he returned a knowing, sad look.Â Soon the plastic Petak’s bag won’t be a UES accessory like the Fairway bag continues to be on the West side. Author rebsPosted on March 27, 2009 August 1, 2010 Categories Food, Local Goings OnLeave a comment on Petak’s Closed WTF! 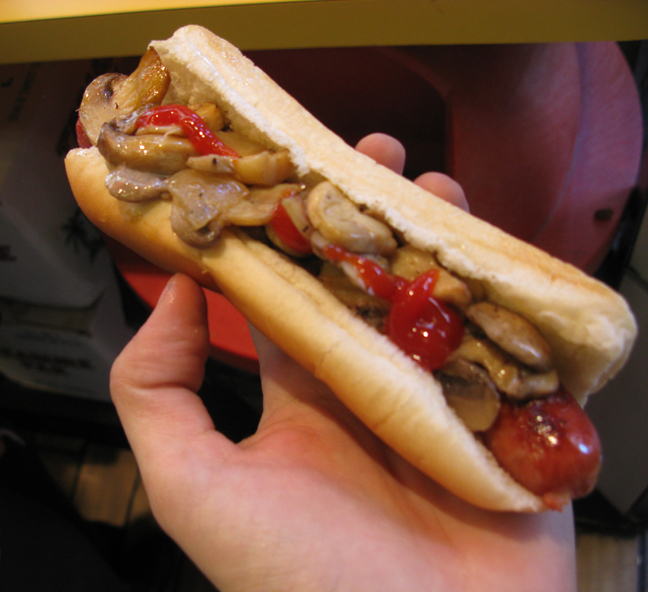 This is “The Musher” – one of Papaya King’s (86th and Third Ave.) new specials – a hot dog with fresh grilled mushrooms and onions – pictured here with ketchup. It’s really good. I’ve had several since this first one.